Wearing all black is such a beautiful thing when you can get all of your blacks to match. Ha ha! When you wear black all of the time you know exactly what I mean. 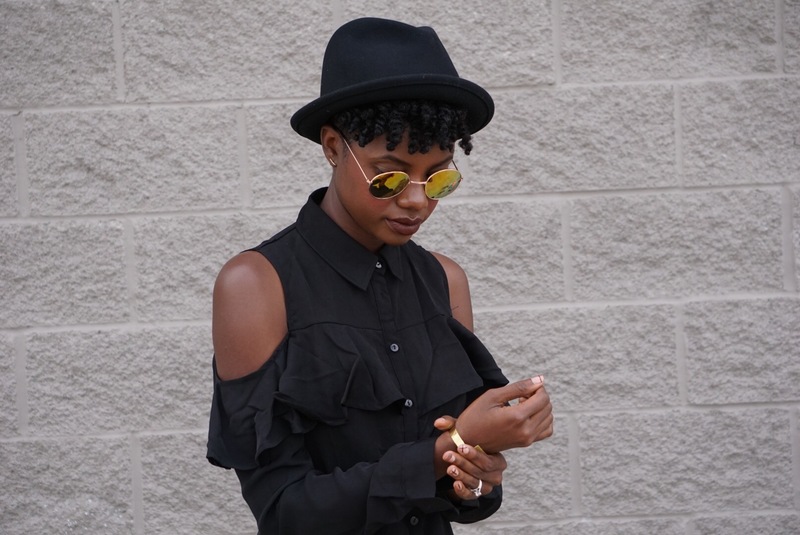 This cold shoulder ruffled shirt dress sponsored by MakeMeChic.com will make your life that much easier. The “all black” look is easier to achieve when you have fewer pieces to include. All this dress needs is shoes and accessories. Choosing this “Viv” hat sponsored by Jamie Slye to compliment this dress was a no brainer. It too has an amazing rich color and fun story to got with it. The Viv is made in the USA, completely crushable, and water repellent. If you’ve seen my three year old son Grant you’d know that I NEED this kind of durability with anything that he comes in contact with. Lastly, I paired my booties from Old Navy to finish off this look and I was all set. This OOTD with take you no time to get dressed and can easily be duplicated. Send me pictures and leave me comments about how you could style a similar OOTD. Enjoy!